Recently I’ve been trying to jazz up the old bedtime routine. You know how it is when you try to leave the room – the kids just wave you happily night night as they snuggle cozily under the blankets. No? Us neither. Sometimes it seems like designing a spaceship to take you to the fourth dimension would be easier than negotiating your way out of a kids room at bedtime. So I decided to change it up a bit and introduced a fun story activity so we can have a few laughs before bedtime and alleviate the rush to get everything ticked off the list before bed. 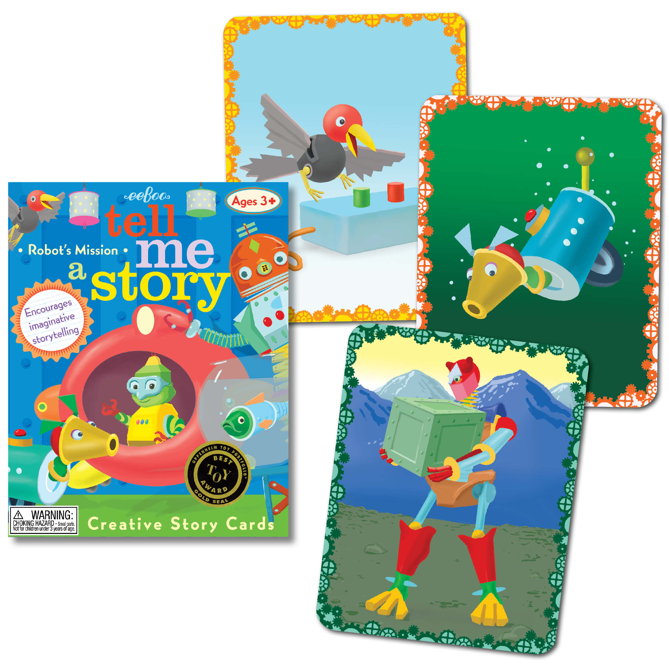 These cards from Eeboo are just brilliant for prompting creative story telling. Our 4.5 year old particularly loves the Robot set of cards, but they come in heaps of varieties. We’ve recently started Skyping with Nana in England once a week at bedtime so she can read the boys a bedtime story and we’ve introduced these cards into the routine after the story. Everyone has fun with them and hearing the way out extrapolations L Star comes up with can be quite hilarious. It’s interesting not only for creative thinking but also memory retention as L Star will often bring back something at the end of the story which was briefly mentioned right at the beginning. We also have this Magnetic Playboard from the same company which L Star got from a friend for his birthday. It has the same characters and is another fun way to explore story telling. Plus it features magnets which are always a hit. And if that’s not enough Creative Story telling wonderment for you, you can always check out these ideas from the ever fabulous Kids Activities Blog: 10 Creative Story Telling Ideas. Happy story telling! Previous Bubl Draw: your art makes music! 🙂 Hope they’re as popular with your family as they have been with ours. Will have to check out your gift site for some Christmas ideas for our lot!